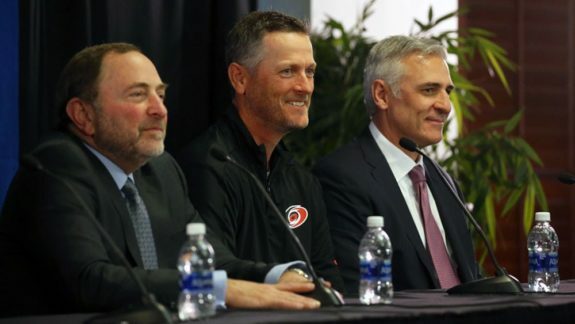 Carolina Hurricanes Help Wanted: NHL hockey franchise needs a general manager, experience preferred. This ad will not appear anywhere for the Hurricanes. It won’t be on LinkedIn or Indeed or even Craigslist. Hurricanes owner Tom Dundon did not move Ron Francis out of his position as the general manager without having a plan. Look for Dundon to hire a new general manager quickly, perhaps as soon as within the month. For those who clicked on the link in hopes of submitting a resume, they found it took them to YouTube, and a video of Rick Astley doing “Never Gonna Give You Up.” Perhaps the line in the song, “Never gonna tell a lie and hurt you” is what the “Caniacs” need to hear during this time of management upheaval. Dundon’s presence has changed things a lot, and it looks like having fun is among the characteristics of a Dundon-run team. Who Might be the New GM? I want someone collaborative, someone aggressive, a good fit for how we’re going to go about making decisions. Someone comfortable with the decision-making process where we take lots of input, and, ultimately, hopefully, the decisions are organizational. I think that’s probably what happens in most organizations. Just someone who’s comfortable acquiring information, whether it’s from scouts and other GMs and other people in the League and their own eye, and putting together a process that we can use to continue to improve the team. What it seems to boil down to is that Dundon is not looking for someone who will pull the trigger on personnel decisions by themselves but will make decisions based on a group consensus from other members of the management team. Dundon confirmed that he would give the potential new hire any time they needed to move, but also that he likes to move quickly. This is simply an extension of who Dundon is and what has made him successful in other ventures – the ability to process information and make decisions. He won’t drag his feet, that’s for sure. A name that has already come up as a potential new Hurricanes general manager is that of Mike Futa. Pierre LeBrun of TSN posted on Twitter on Friday that the Hurricanes have asked the Los Angeles Kings for permission to talk with Futa. Lisa Dillman of NHL.com also followed up on Twitter that the permission was granted. Futa has been a target of general manager searches in the past. The Buffalo Sabres and the Toronto Maple Leafs both looked to hire Futa away from the Kings but were not successful. The question now is, “Will Dundon be able to lure him out of Los Angeles?” Futa fits the bill of someone with a great deal of prior hockey experience and might be ready to step into the role of general manager. Some might say that Dundon should go for someone who has experience as a general manager already. Ultimately Dundon will select that he believes will be on the same page with him and gives the team the best chance of improving quickly. If Dundon sticks to what has gotten him the success he has already attained, it won’t be a decision that is procrastinated on or over-analyzed. He’ll process, decide and implement, the formula that makes for his success while others might be stuck in the valley of indecision. Dundon is a billionaire. He did not get to be a billionaire – achieving that level of success – by being indecisive. While others may have seen some merits in waiting until the offseason to move Francis out of his position as general manager, Dundon made a decision and acted on it quickly. The timing of Dundon’s move is actually good since the draft and free agency are around the corner. He will be able to find a new general manager and get him onboard with his vision for the team in plenty of time to prepare for the draft and free agency. There will be a lot to consider in the offseason, and a new general manager will need plenty of time to prepare. Whether it’s buying an emerging company, or making decisions for a professional sports franchise, Dundon has shown that he is not shy. Within hours of being announced as the new owner of the Hurricanes, he was making changes to some of the pricing around the PNC Arena where the team plays its home games. These included the price of some concessions and for parking. He has been a whirlwind of activity since taking over, with things like selling Hartford Whalers gear as one of the things implemented for the fans. Also, offering upper lever ticket-holders the opportunity to move to a lower seat and reduced pricing for multiple games are Dundon policies. He said he wanted to make things better for the fans and he meant it, wasting no time in making changes for their benefit. Dundon did not wait to get involved with trying to improve the fan experience, and he did not wait long to move Francis out as general manager. It is doubtful he will wait long to hire a new general manager. Should the Oilers Consider P.K. Subban?